By Chris Scott Barr on 04/21/09 • Leave a comment! I’m still not really on the whole digital picture frame bandwagon. Honestly, I guess I just don’t have a need to cycle a few hundred pictures on my wall or something. If I were going to get one, I’d go for something a little less than ordinary. I’d either get one that actually did a little more than show pictures, or I’d make my own. 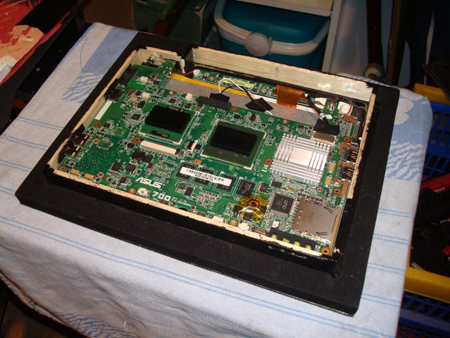 From the looks of this mod, it would be pretty easy to use an Eee PC for one. Having a full-fledged computer working as your picture frame does leave you with a lot more options. 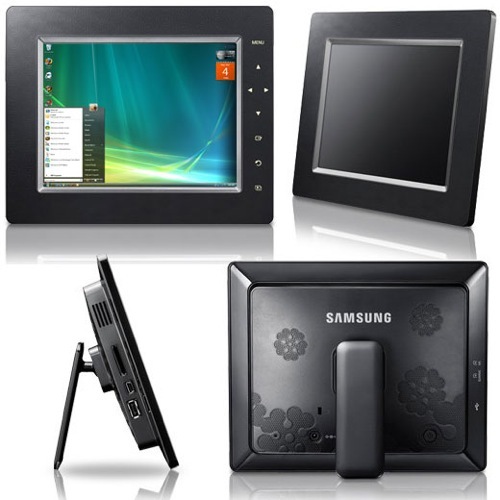 Now you can add a touchscreen and control various media through the house with a touch. The early Eee PCs are really cheap, so this might just be a fun mod for someone who doesn’t just want a boring digital picture frame. So you got one of those useless fancy digital photo frames for Christmas, but do you really want to spend your day looking at photos of your family? Of course not! 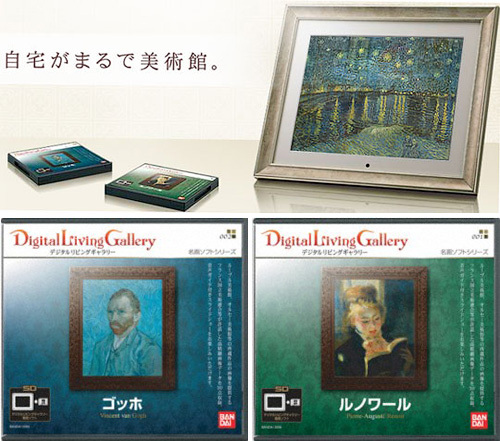 Thankfully Bandai is the first company to come to that realization, and their new Digital Living Gallery line of digital photo frames reflects that. Instead of a cheesy plastic frame, the LCD is surrounded by a traditional, and tasteful, wooden frame like you’d find on a painting. And since that would probably seem out of place while the frame was cycling through photos of your trip to Carlsbad Caverns, Bandai will be pre-loading the frames with highbrow content. At launch, the Digital Living Gallery will be available in a Pierre-Auguste Renoir or a Vincent van Gogh version that each come with 30 high-quality digital versions of classical works from each artist. And Bandai will be selling SD cards with works from other artists as well, so you can continually expand your frame’s collection. While you’re not going to fool anyone into thinking that’s a real van Gogh you’ve got propped up on your desk, something like this would go a long way to classing-up your cubicle, once you get rid of all those Halo figures. The Digital Living Frames will be available starting January 30th for about $580 (52,290 Yen) while the SD cards will sell for about $55 (4,980 Yen) each. 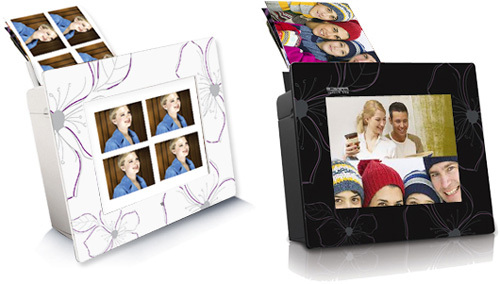 For the most part there’s very little that distinguishes the hundreds of different digital photo frames on the market. But the Memoir from Skyla (the new consumer electronics division of LiteOn IT) will definitely stand out in the crowd since it features a built-in photo scanner that makes it easy for anyone to convert an old print into a digital photo. Because of the size of the frame the scanner is limited to handling 4×6 prints or smaller, but the 1GB of internal memory should be enough to store about 200 4×6 photos scanned at 600 dpi.. 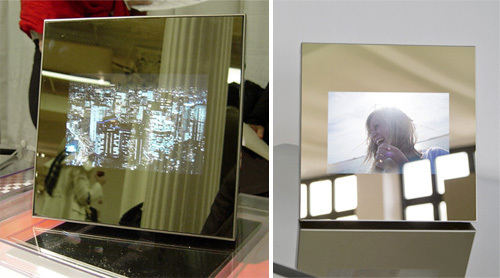 The Memoir also features pretty much everything else you’d expect in a ‘modern’ digital photo frame including an 800×600 resolution LCD, two USB ports for connecting flash drives or syncing the frame to your PC and support for MP3s, MPEGs and other image files. However I don’t see a mention of slots for compact flash or secure digital cards, but I’m going to assume those are included as well. The Memoir should be available in late December and will have an MSRP of $219.99. I’ve yet to find a digital picture frame that actually made me want to buy it. There have been a few interesting ones here and there, but at the end of the day you’re shelling out a good big of money for something that’s just going to display pictures. However, Samsung has piqued my interest with their new line of frames that can also act as an extra monitor for your PC. These new frames use a technology called UbiSync PC (likely based off of DisplayLink technology) that allows you to plug it in via USB, and have yourself either an 800×600 or 1024×600 screen (depending on which one you buy). This screen would be very useful for storing toolbars, icons or whatever. Then when you’re not using it, it turns into a simple digital picture frame. The 8-inch version runs $142, while the 10-inch is $204. Honestly, for that price, I’d just buy another monitor and set my screensaver to display pictures. You’ll get the same result, just with a larger monitor. By Andrew Liszewski on 09/02/08 • Leave a comment! I have to give LG credit for at least trying to make the over-saturated digital photo frame market a bit more interesting. Their DP889 unit not only features an 8-inch LCD display but also has an integrated DVD player. 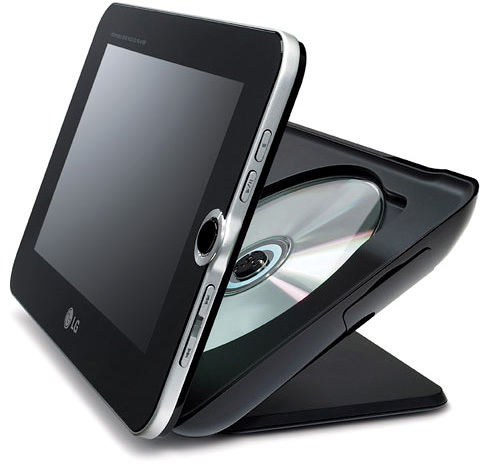 So not only can you browse photos that are stored on a DVD or a CD, but you can also use the unit as a portable DVD player with the supplied battery pack providing up to 3 1/2 hours of playback. Other features include audio/video inputs and outputs allowing you to connect other devices like a game console, a 3-in1 memory card slot, a flash drive compatible USB port, built-in speakers and even dual headphone jacks. And while LG lists the DP889 as having an MSRP of $279.95, Circuit City currently has it on sale for $199.99. It’s easy to share a digital photo via email or a public website, but how do you accommodate those family members who haven’t quite embraced the digital age just yet? Well one option is to upgrade your digital photo frame to one of these models from Prinics which feature a built-in 5×7 printer. That way, when your parents are scrolling through baby photos and lamenting about how they’d really love a copy of a particular shot, you can print one out for them right then and there. The printers use a special, self-contained photo paper & ink cartridge that’s extremely easy to replace, and since the cartridges are completely sealed, they apparently have an unlimited ‘use-by’ date. I’m not sure how much the cartridges cost (which is a factor that could make or break the product) but each one is good for 36 shots. The Prinics frames come in either 7 or 8 inch models and besides the printer they also feature memory card slots, an easy to use GUI, a remote control and even patterned or plain black acrylic frames. Unfortunately the Prinics site is a little vague when it comes to pricing, but if they intend to compete in the 5×7 photo printer market they’ll have to aim for a reasonable MSRP. By Andrew Liszewski on 08/29/08 • Leave a comment! Besides dropping in price, digital picture frames have advanced quite a bit over the past few years. The resolutions and image quality have definitely improved, and instead of having to rely on a small set of buttons or a cramped remote for navigating through hundreds of photos, they now feature intuitive touch screen interfaces. On the other hand, touch screens usually means your display ends up covered in fingerprints, which is why Kodak’s latest model, the EasyShare P520, features something they call the ‘Quick Touch Border’ which is basically a touch-sensitive strip that runs around the perimeter of the LCD. The UI can be navigated using just the touch border, and like the iPhone, it even allows you to swipe your finger across the bottom to easily scroll through your photos. Other features include a USB port and dual SD card slots for expanding your storage space (I’m not sure how much memory the frame actually comes with) a 5-inch LCD color screen that uses ‘Kodak Color Science’ for “vibrant colors and crisp detail” and your choice of silver, red or white frames. It should be available sometime in September for $79.95. 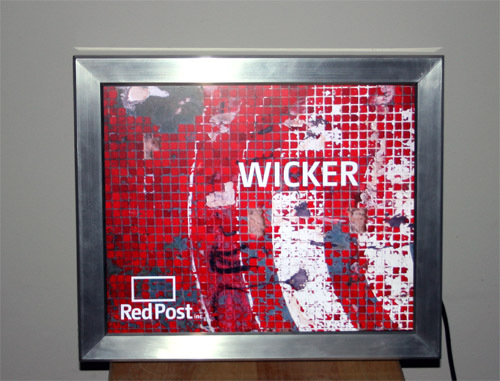 Digital picture frames are nothing new, however, the guys over at RedPost are taking the idea a little bit further than most companies. Rather than selling a puny 7-inch screen with an SD card slot, they’ve got their RedPost Sign (beta) which has a lot more to offer. First, it has a nice 19-inch screen, which not only is great for viewing pictures but also makes it great as signage for business purposes. On the inside you’ll find a tiny PC with a 1.5GHz VIA C7 CPU and 1GB of RAM running a custom Linux distro. Now that’s my kind of picture frame. I’ve actually had the opportunity to test out one of these Signs, and I must say that I never actually thought about purchasing a digital frame until I saw this. One of the first things you have to get past is the fact that it is big and heavy. The frame itself is around 3.5” thick, (4.5” if you count the Wi-Fi antenna sticking out the back) and while I didn’t have a scale handy, I would guess that it would take more than two swallows to carry one of these (even if they were African swallows). The size and weight are due to the fact that they are building them by hand out of industrial materials, and they’re packing a small computer on the inside. If you’re the kind of person that loves Linux, you’ll love the Sign. Your storage device is actually a flash drive, which not only makes it easy to upgrade, but it makes installing a new OS quite simple. Just pop it into your desktop and install. If you’re more into Windows, you could always put on a copy of TinyXP or something similar to suit your needs. You can read my entire review after the jump.